Please join us for the whole weekend whether you ski or not. Uludag is located 2,543 meters above the sea level. Are you not a winter sports person however you like to get a fresh mountain air, have fun and enjoy the beautiful scenery? Uludag can offer you cafes & restaurants with amazing views either by the slopes or very top on the mountain. You can pay 30tl for a round trip passenger lift to get up there 👆 to enjoy specially made “warm wine” “sicak şarap”, have sucuk-ekmek and watch the skiers. If you like to spend some time in the hotel, it has a nice large lobby with a big fire place and also a very nice lounge with a view on the second floor. We highly suggest cross-country skiing (basically walking with easy skies) or hiking. Early morning starting 4am and on, the bus will pick us up in Istanbul from different locations and take us to our hotel in Uludag. 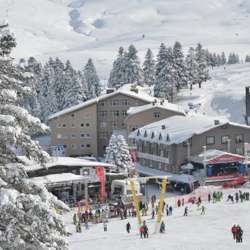 We will go straight to ski rental and get ours for a discounted price of 40tl per day. We can hit the slopes right away with those of you who are ready. Some of you might want to purchase 1/2 day on Friday and hit the slopes in the afternoon. Saturday night the hotel will arrange a live music for us 🎶 🎼 🎵 (on the house). One of our councils will sing for us 💃💃 We have known the guitarist for many years now, and I guarantee you an amazing fun night! !